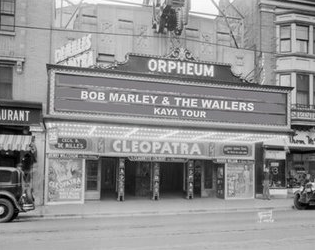 Bob Marley and the Wailers kick off the U.S. leg of their Kaya tour on May 18, 1978 in Ann Arbor, Michigan. Over the next few weeks they visit several college towns in the mid-west, playing mid-sized music halls and theaters. They play the Orpheum Theater in Madison, WI on May 25, 1978.